Rolland is a juvenile Common Raven that came to Badger Run in August 2015. He was originally taken from a nest in Beatty, OR when he was just a few weeks old (not even sure if his eyes were open at the time). The other nestlings were dead so the folks that found him did a “good thing” in rescuing him. Unfortunately they didn’t turn him over to us & tried to raise him as a pet for about 6 weeks (which is illegal, by the way). That was about how long it took for them to figure out what a bad idea having a raven as a house pet was. Think flying bull in a china shop. So they gave him to a friend who called us after about 3 days of raven sitting. Because Rolland was hand reared, he was fully imprinted on humans & would have zero idea of how to fend for himself in the wild. Or so we thought. Turns out that after rooming in with a “wild” adult raven we’d been rehabbing, Rolland quickly began to discover his instinctual wild ways. Within weeks he wanted nothing to do with people. Ravens are omnivorous & will eat meat. Rolland even demonstrated he was quite capable of killing a wayward mouse for food. So at that point, we realized he was ready to be a wild raven & go back where he belonged. In 2008, after hunters shot his mom, a little 4 week old badger was brought to Badger Run. Raised alone, he imprinted, meaning he had no fear of people. So we named him Dhru and trained him as an Animal Ambassador. Dhru did a dozen presentations, delighting guests with his playfulness. As he matured, he began to react differently, not liking crowds at all. We began to “un-train” him and taught him to hunt. After 2 months, he was ready for a test. We fasted him for a few days, then put him in unfamiliar territory and had 2 very brave “strangers” approach with food. As hoped, he backed away, snarling. With that success, we felt confident in his ability to survive in the wild and he was released on private property in a remote area. We will always miss seeing his fuzzy face peeking around his den box, but we are thrilled that he is able to live his life in the wild as he should. “Gaea” the Red-Tailed Hawk was hit by a car in September 2007, and suffered a fractured shoulder. Not even a year old at the time, her bones healed quickly. But unfortunately, the healed callous that formed at the site of the break interfered with the rotation of her shoulder and we believed she would be unable to fly for life. Female raptors, like the Red-Tailed Hawk, are usually larger than the males, and Gaea weighed in at a massive 2 ½ pounds! Gaea pleasantly surprised us by strengthening her wings and stretching her shoulder, and after being given large enclosures to encourage exercise she developed the ability to fly and hunt. Gaea was soft released (which means released from a known location with the ability to return for food whenever desired) and the volunteers that handled Gaea have spotted her flying with a mate. 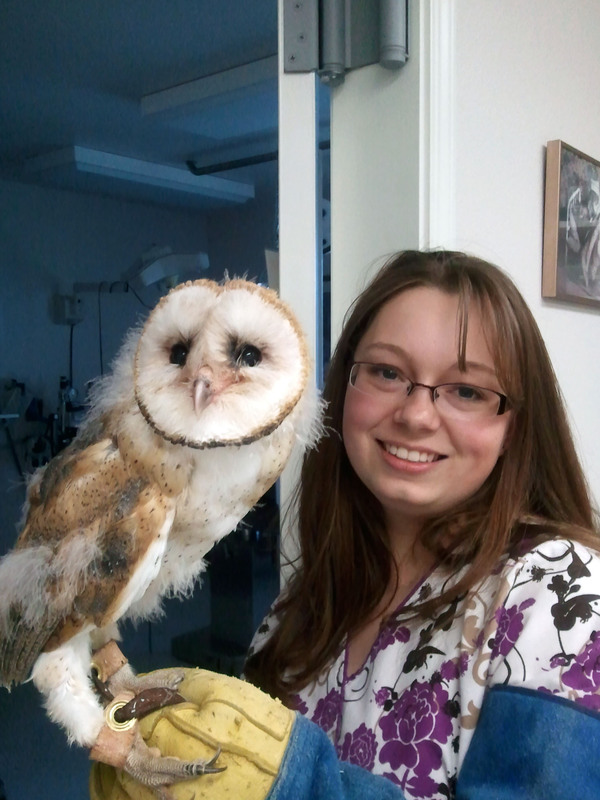 “Mushu” the Barn Owl, fell from her nest in a potato shed when she was just a few days old in June 2012. The fall broke her leg in three places and despite the best efforts of the veterinarians, the leg sustained severe neurological damage, rendering it virtually useless. (We thought!) Though she could fly well, if released, we thought the non-functioning leg would severely impact her hunting success and she would probably starve to death. So, she served as an Animal Ambassador for a few months until a volunteer didn’t latch her pen correctly one day and she escaped. We were unable to catch her right away, but knew where she was and monitored her closely. It appears that she has taken up with three resident Barn Owls in Keno, who seem to be cooperatively feeding her and helping her get along. She has been seen with a mouse in her talons, so she is having some success on her own. We have continued to monitor her progress, but it seems that she has found the friends she needs to survive in the wild. Go Mushu! This beautiful guy came to us in 2003 after being hit by a car. He suffered a concussion and lost the sight in one eye. We were afraid that with only half of his peripheral vision he would starve if released. Red-tails are too common to have breeding programs so we tried Pirate as an educational bird, but he had one major problem – he got car sick! So the Ambassador life was not going to work for him. New plan then. We began using food on a string that we would drag around him to teach him to track by moving his head. He soon learned to continuously move his head to increase his peripheral vision range. With practice he learned to successfully spot and kill live mice, no matter where we put them in his enclosure. With his new skill set we were able to release him in a nearby canyon. Four weeks later we saw that, not only was he doing well, but that he had found a mate. Way to go Pirate! A family cutting firewood in Chiloquin accidentally cut down Sparky’s nest tree in 2009. Rather than leave him there so his mom could find him and move to a new tree, they brought him home and tried to raise him. They soon realized that squirrels do not make good pets! After he began “marking his territory” all over the house and chewing all the electrical cords, they’d had enough and brought him to Badger Run. We worked to teach Sparky how “real” squirrels behave and to be afraid of humans. He learned that food does not come in a bowl, but that he had to work to find it hidden in his enclosure. By then, it was too close to winter to release him since he would not have time to stockpile food for the cold months. We kept him until Spring, then released him back into the woods, confident that he was ready for the wild. Great Horned Owls typically have 2-4 chicks which rapidly outgrow their nest. These little chicks just about double in size daily for the first few weeks, eating close to a pound of food each day. When they no longer fit, but cannot yet fly, they venture out on nearby branches, where their parents feed them. Often, they fall to the ground and are in danger from dogs, cats, people and other wildlife. Such was the case with Sully. Brought to Badger Run for raising in 2009, we had to carefully tear up whole natural prey items such as rodents, snakes, and other small mammals, feeding him with forceps from behind a blind so he did not see humans as providers of food. As he got larger, so did his food items. Eventually, he was given whole prey to tear up himself. When old enough, he was given a variety of live, natural prey items, to hone his hunting and killing skills. He passed his lessons with “flying” colors, and is now soaring above the Klamath Basin, living the great life of a Great Horned Owl. “Leno” is a Scrub Jay that fell from a nest, late in the Summer of 2007. If his finders had put him back in the nest or in a box up high, safe from cats and dogs, his parents would have continued to raise him in the wild. However, these well-meaning folks tried raising him themselves for several days then called Badger Run Wildlife Rehab. As a result Leno thought all humans are “food givers” and he was very imprinted, preferring human company to that of other birds. A member of the Corvid family, (Jays, Ravens, Crows, etc. ), Scrub Jays are extremely smart and Leno knew that doing education presentations meant that he got some of his favorite treats to eat. He was always eager to go show off! But after 2 years of therapy and retraining, he was able to cope with life in the wild! Leno was released!